The Thrianta, a red-orange rabbit was first developed in the 1930’s as pets for the Dutch Royal Family. H. Andreae, a school teacher from Holland crossbred Black and Tans, Havanas and the self-coloured Tortoise Papillon so that he could dedicate a red rabbit to the Royal House. 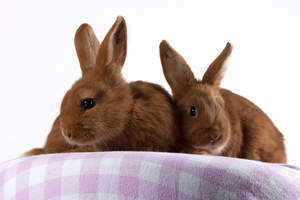 Unfortunately, due to the rationing of food during WWII, Thrianta rabbits as well as other breeds and small animals were eaten by the Dutch people. The population of the breed became so low that it was almost considered extinct. After the war the Thrianta population was recovered, but crossbreeding meant that a breed known as the European Sachsengold was more widely recognised by European breed clubs. The Thrianta found its way to the UK in the 1980’s where it soon became recognised by the British Rabbit Council. 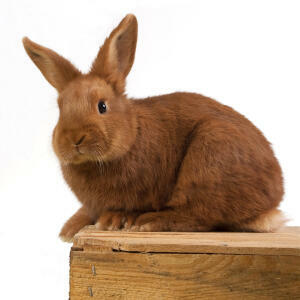 Thrianta rabbits should have a rich, red colour coat and weigh between 5 and 6 pounds (2.3kg and 2.7kg). They are a small but particularly desirable breed with short upright ears and a definitive arch in their backs. Thrianta rabbits are active and intelligent pets, who’s compact size makes them perfectly manageable around the house. They make great first pets for children and adults alike.